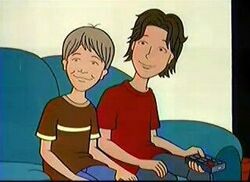 Youngest brother of Sandi Griffin, with greyish hair and Sam as the middle brother. Described in The Daria Database as: "10 student, brat. Likes to pound his brother back, pick at scabs (anyone's) and watch things drop. Plans to someday marry Quinn." In every appearance, Chris is an uncontrollable, spoiled jerk who enjoys making his sister suffer (including leaving her outside to freeze in "Daria Dance Party"), mouthing off to people, and having fights with Sam. In "Fair Enough", he and Sam enjoyed physically assaulting people at random, and "Dance Party" shows a younger Chris and Sam destroying their sister's creations for the sheer delight of it. In contrast, he's very nice to Quinn in "Gifted". Chris and Sam both appear as the main characters in Wouter's comic "Through a Webcam Lens Darkly" where he's shown to be the smarter of the two, having hooked up a camera phone so they could spy on Quinn from her own room ( A plan that failed when the phone ended up in Daria's room instead) Chris is also shown to be the more literate of the two, using a wider vocabulary than Sam and (disturbingly) having a wide knowledge of the Fashion club rules. Stating that Daria's tighty-whiteys are a definite Fashion-don't. Sam and Chris Griffin are named for Sam Johnson and Chris Marcil, who wrote the following episodes: "College Bored," "The Big House," "The New Kid," "Depth Takes a Holiday," and "Speedtrapped." Chris Griffin's name predates the Seth MacFarlane animated comedy Family Guy, where the teenage son of Peter Griffin is named Chris. This page was last edited on 25 September 2013, at 23:09.